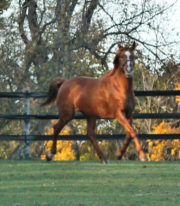 We are grateful that Doug and Shannon Langer of Maple Run Farm have entrusted us with their homebred Elite Mare Chenya. 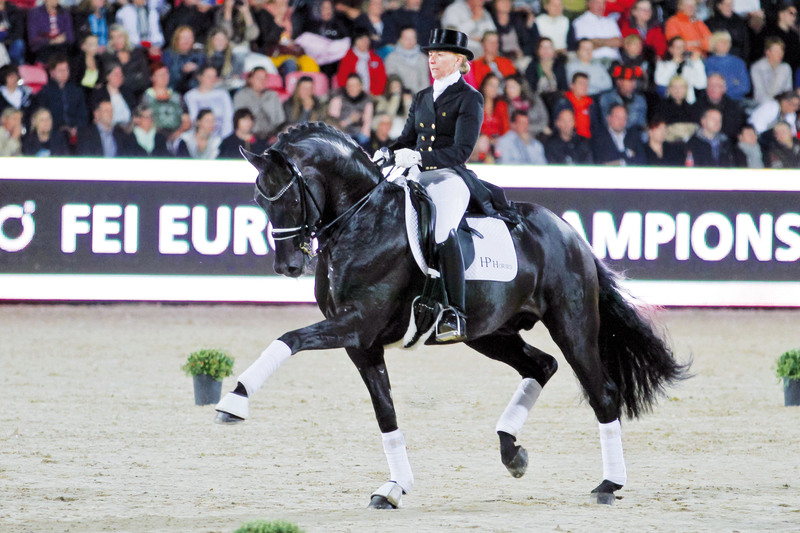 Full sister to the American wonder-horse “Cabana Boy”, she is by Contucci (Caprimond / Lungau) who won the Dressage Portion of his Medingen Stallion Performance Test with a score of 147.11, inluding 9’s for Character, Wilingness to Work, Trainability, Walk and Trot. 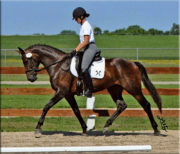 Chenya’s damsire, Bordeaux, also won the Dressage portion of his SPT with a score of 145.96. He brings the valuable blood of Bolero / Grande; while her grand-damsire is the immortal Weltmeyer. 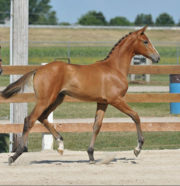 Chenya proved to be easy undersaddle, showing rhythm, suppleness and enough spark to stand out in the show ring. At 5 she was inspected for the Main Studbook, with highlight 8’s for Head, Neck, Saddle Position, Type and Femininity; and she absolved a very good Mare Performance Test, including scores of 8, 7.5, 7.5 for W-T-C, as well as 7.5 and 8 for Jumping Technique and Scope. 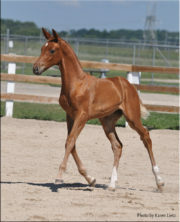 EM Chenya has been a successful broodmare and an excellent mother, with her first filly EMC Seraphina MRF (by Sinatra Song) winning her foal inspection, her EMC title, and now triumphing at PSG and I1. Chenya has produced other beautiful fillies by Rubignon (now Elite Eligible), Damsey (Top Filly in 2014), Bretton Woods and First Ampere; and is now in foal to super-producer Furstenball (Furst Heinrich / Donnerhall / Classiker) for a May 2017 foaling. 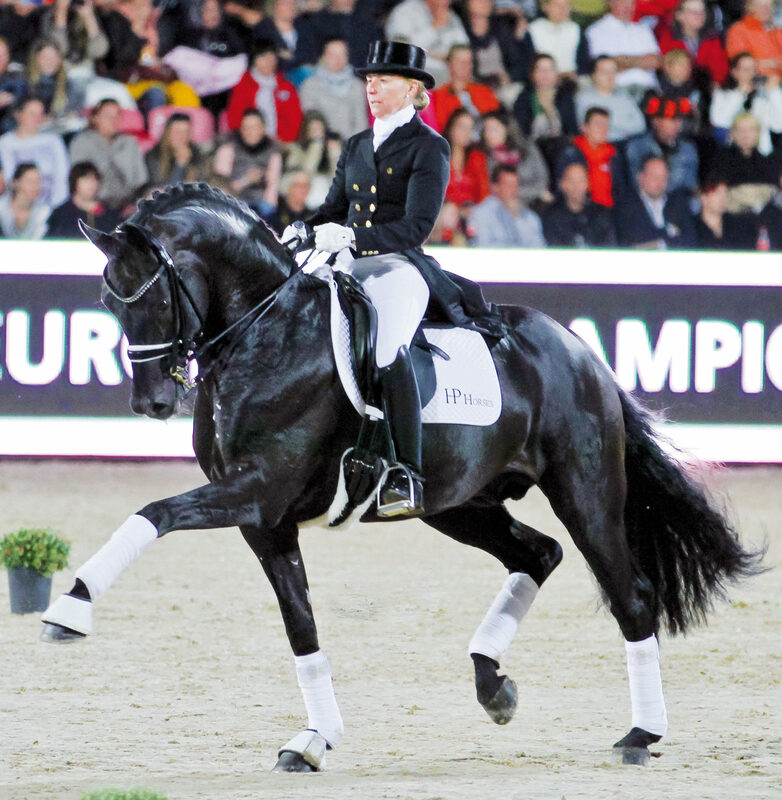 Furstenball is an outstanding sire who won his licensing and stallion performance test, was regional and national champion of Germany, sire of champion stallions, winner of S level dressage classes, 2013 VTV stallion of the year, and number 1 of the FN breeding valuation throughout Germany in 2015. 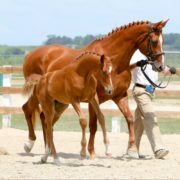 These pictures show Chenya, a sampling of her foals, and the sire of her 2017 in-utero, Furstenball. Also below, brief videos of Furstenball and of Chenya at the inspection of her beautiful filly Fiona MRF, and at liberty, November 2016. 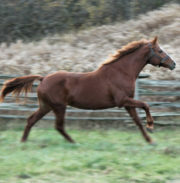 In late May 2017 “Furstentanz“, the Furstenball filly, made her debut at SunnyDays, and immediately SOLD to a neighbour who saw her at a day old. UPDATE: At the Parkwood venue for the 2017 Hanoverian Verband Inspection Tour, our beautiful Tanzy was chosen Top Filly, Reserve Dressage Champion Foal, and Reserve Hunter Prospect Champion. Furthermore, at end of the 2017 tour she was selected by Dr Christmann for the 2017 Albert Kley Memorial “Top Ten Foals” Award. Well done, Tanzy! For 2018, Chenya has been bred to the 2014 Adelheidsdorf SPT Champion “Buckingham” by Bordeaux / Rousseau, who was given a 154 Breeding Value for Dressage, with a 9.5 for rideability. UPDATE: For 2019 Chenya is back in foal to Furstenball with a due date about June 10th. Yippee!